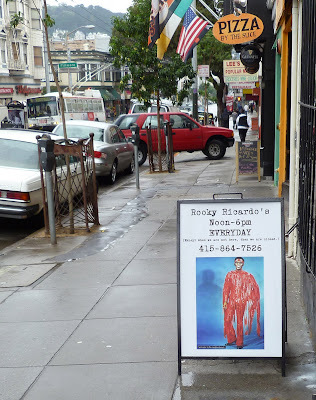 One must walk or drive through the streets of San Francisco to find Memphis Minnie’s. 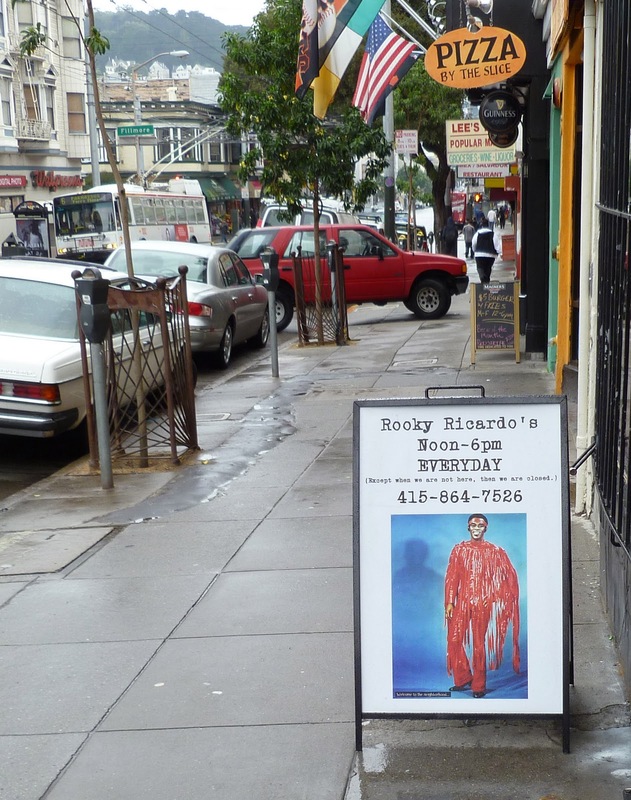 You will pass by ‘Rooky Ricardo’s Record Shop’ and you know you have almost arrived at one of the best barbeque joints in the Bay Area. Memphis Minnie’s is a destination smoke house restaurant, serving some of the finest barbeque we have ever tasted. Today we sampled several non-barbeque items from the menu. 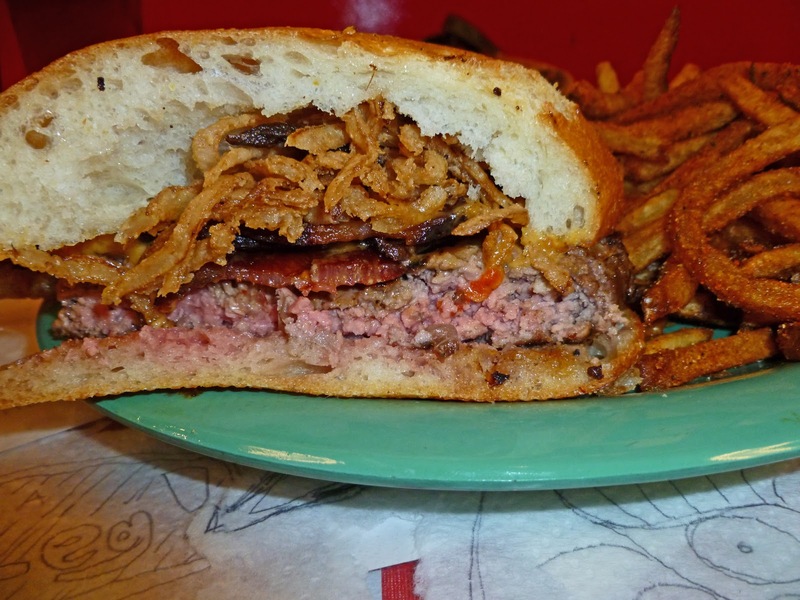 The ‘Minnie’s Maxi Burger’ is a fairly new item on Memphis Minnie’s menu. Half a pound of freshly ground chuck is cooked on the grill and covered with house made pimento cheese. To make this burger a Mad Meat Genius must have creation, some house cured bacon and crispy onion strings are added to this wonderful burger sandwich. This is one wild and delicious burger. It was very rich with the pimento cheese and the bacon was over the top crazy delicious. I may have been happy without the onion strings but it was part of the experience. Some pork roll appetizers where added to our meal to compliment this Maxi burger. 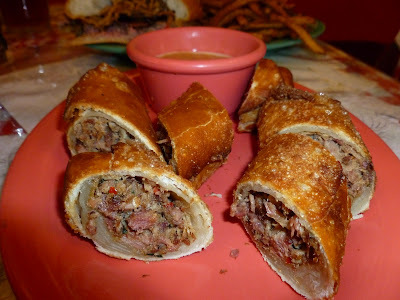 These fried tubes of meat love where served with a decadent spicy mustard mayonnaise type dipping sauce. This sauce had just a slight kick to send these meat rolls into outer space of flavor. When you order barbeque at Memphis Minnie’s, the meat comes to your table without sauce. The food is so good that you do not even need sauce but four different sauces are available at your table. 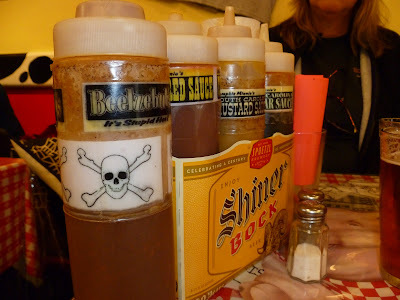 You may see the skull and cross bones on the bottle of Beezlebobs. I can honestly say this is one sauce that Chilebrown cannot handle. This may be hard to believe but it is actually to hot for my palate. There, I have said it with my head hung low. Ms. Goofy and I are taking a little breather from the salt mine and 'Wally World' this week between the Holiday's. We traveled to the 'City' and paid a visit to the Toronado one of our favorite beer emporiums. Jeezes Louise they have over 45 beers on draught and just as many Belgium and specialty beers in their ice cellar. It is a good thing it is right across the street from Memphis Minnie's for meat indulgences. 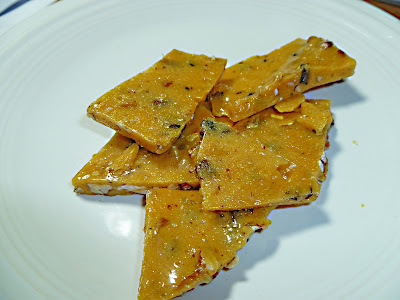 We had numerous meat flavor extravaganzas, but today we we will share the 'Smoked Pecan Bacon Brittle". Sweet, crunchy, salty, a littlle smoky, with bacon flavor.Little pecan bits with bacon gave us a treat. We had decadent delicious leftover bites left over with a bacony salt sweet flavor awaiting a toothpick or floss movement. This was some most excellent stuff for the end of our Memphis Minnie adventure. Stay tuned for the barbeque delights from Memphis Minnies. 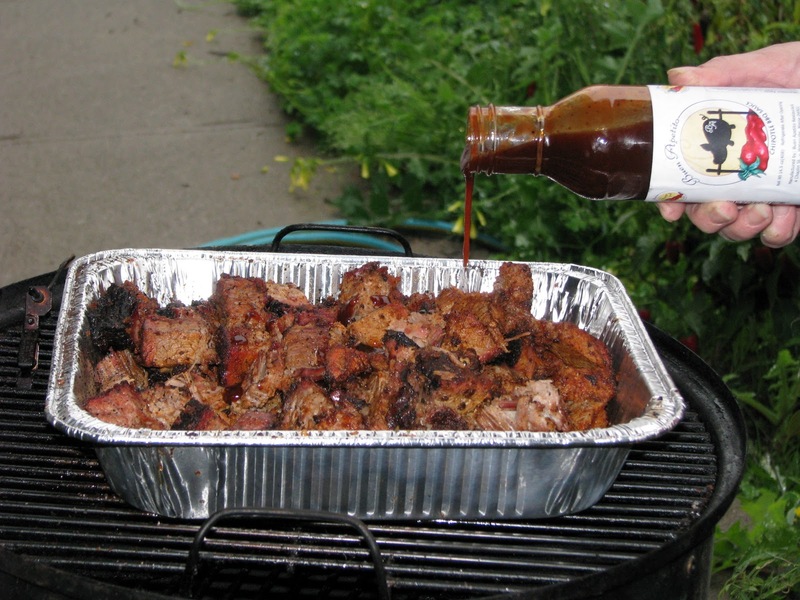 What are Burnt Ends? How come, on the West Coast nobody cooks this delicious barbeque dish? The ‘Point’ end of a brisket is cooked to the temperature of one hundred and ninety degrees in your favorite smoker. This roast is rested and then sliced in to cubes of meat joy. A little more rub is added to the meat and it is put back into the smoker. 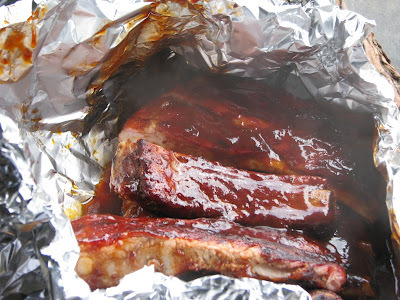 Barbeque sauce is added and cooked a little longer to finish this meat candy. Brisket and especially the point end are not easy to find on the West Coast. 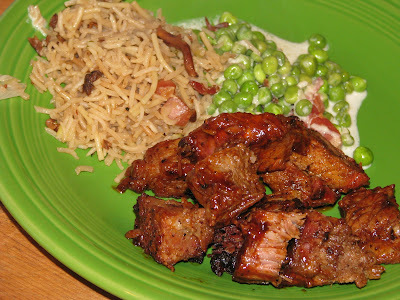 A brisket consists of two distinct areas of the flat and the point. The point end of brisket has more fat that equals flavor. This cut of meat is a staple in Texas and the Midwest. Ms. Goofy and I discovered Burnt Ends on our “Strange and Wonderful trip to Kansas for the ‘American Royal Barbeque Championship. All barbeque restaurants in Kansas served burnt ends. We were hooked and had to recreate this dish at home. A combination of maple and apple wood was our smoking material. We started the cooking process the night before. It took 14 hours to bring this baby to temperature. When we took it out of the smoker I almost fainted right there because it smelled so dang good. It was cut into cubes and some more of my favorite rub was added. It was sauced and cooked an hour longer. Patience is very difficult when you smell the aroma emitting from the cooking vessel. Meat Candy is all she wrote. These little meat pillows are smoky, oh so tender and satisfying. The edge of these cubes are caramelized with flavor that has to be experienced.. This dish will be added to the memorable meals of our culinary memory banks. Ah! Who needs a green egg anyway? Merry Christmas everyone. Ms. Goofy, Oscar and Chilebrown hope your holiday is full of bacon, meat and a green egg is under your tree. Every once in a while, you will pull up to a meat market and just by looking at the exterior you will get that special feeling you have arrived at the new ‘Meat Mecca’. “Willowside Meats Inc' is located in a rural area of Santa Rosa California. You will need to slow down on this country road or you will drive right past this meat market. A small sign proclaiming; “Your Local Family Owned Meat Market”, will be your clue to slam on the brakes and turn into their driveway. Once inside, you will notice a beehive of meat activities. Several people are slicing, dicing and wrapping various cuts of meat. There are several meat cases displaying their wares. 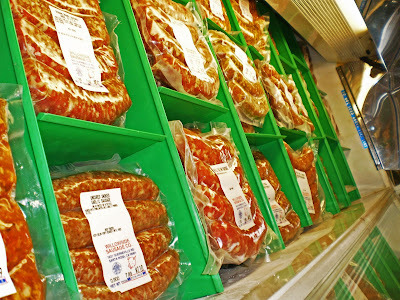 One meat display case was full of 25 different varieties of nitrate free frozen sausage. 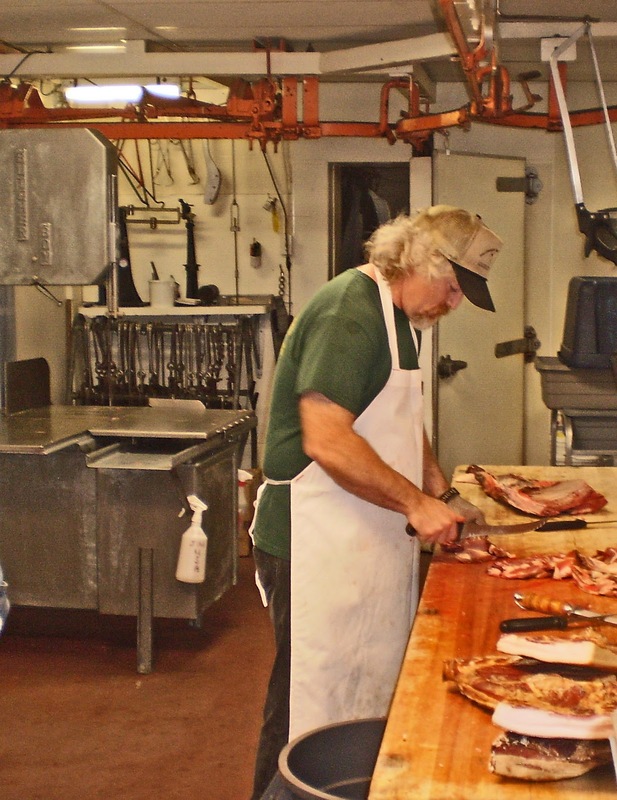 Don and Darlene Alberigi have owned Willowside Meats since 1986. They process local ranch meats and wild game. 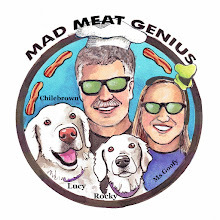 They will custom cut and wrap your meat projects. Don gave me a tour of the meat lockers and meat smoking area. Don had some prime and choice rib roasts hanging and aging for the holidays. Willowside does have slab bacon. It is house cured and smoked with hickory wood. 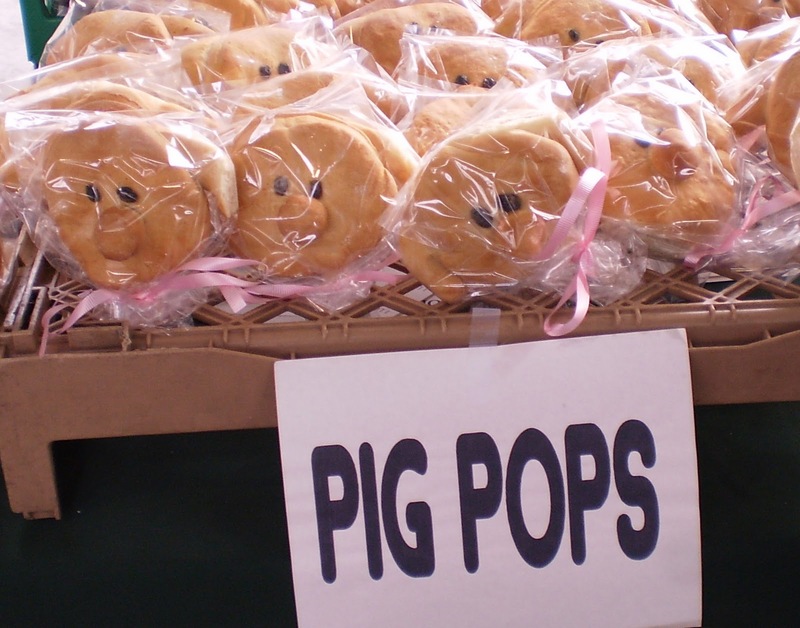 We picked up some beautiful pork chops that Darlene told me that these pigs are fed a diet of acorns. Jalapeno cheddar sausage was one meat tube that had to be tried. I would have purchased the other 24 varieties of sausage, but the credit card limit was getting low. I did pre-order a (prime) prime rib roast for the New Year. We returned home with a sleigh full of meat. The bacon smells so smoky good. It was cubed and put into some slow baked beans. We had a wonderful meal of pork chops and baked beans. This was just a little sample of some great meat from our newly discovered find. 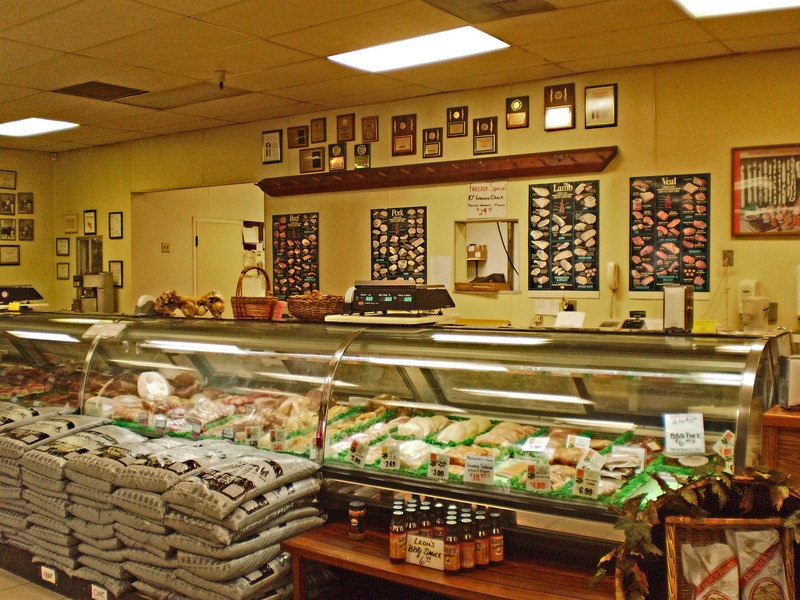 Willowside Meats is a destination meat market. 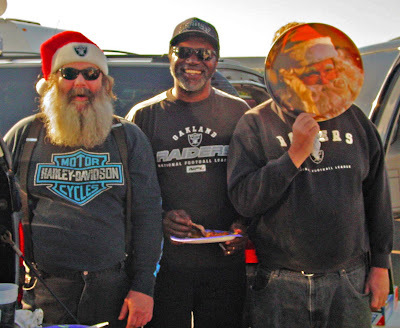 We have already planned our return trip to pick up our prime rib roast. This was a truly wonderful meat market and will be looking forward to trying more of their products. A journey in search of new meat markets brings us to the Northern California, Santa Rosa area. We are visiting two meat markets that we have not explored. Today’s ‘Meat Adventure’ will bring us to ‘Martindale’s Quality Meats & Deli’. Martindale’s is located on the edge of town in small strip mall. Once inside this meat palace you will experience a full service protein excursion. They sell award winning Hams, Bacon, and Smoked Sausage. In fact their plaques and trophies are on display for the viewing. There is a selection of pre-marinated tri-tips with several different flavors. Stuffed pork chops, sausages and various roasts are displayed in the vast meat cases. A full service deli will make and create your sandwich desires. Crazy Crab at one time was the mascot for the San Francisco Giants baseball team. This mascot took a lot of abuse. Sports mascots need to be aggressive and not tasty. 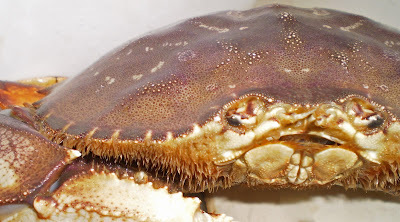 Crazy Crab was shelved but we still have Dungeness crab for our personnel use. 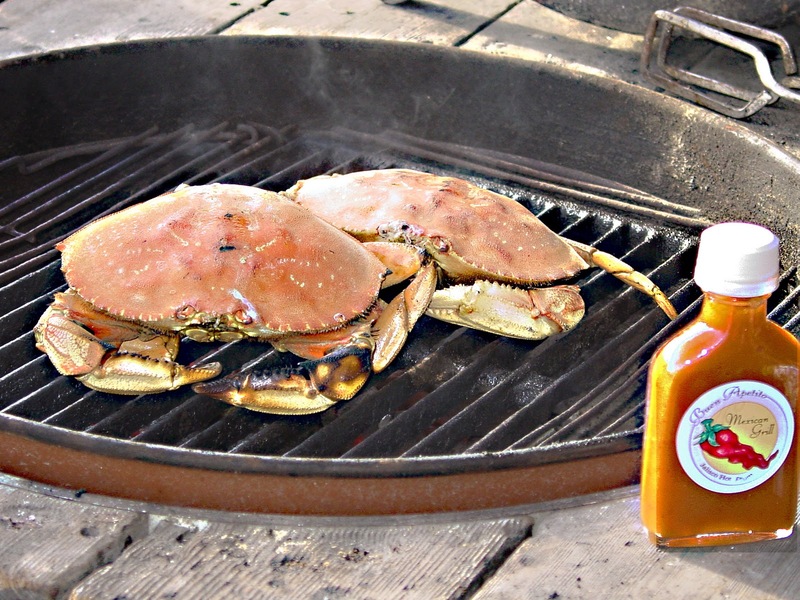 The San Francisco Bay Area is the home of Dungeness crab. Oh man! Is this crab so sweet and tasty right now. 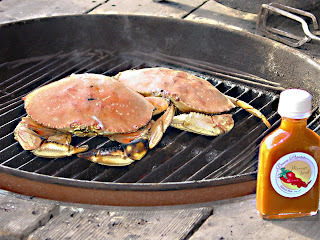 The first crabs of the season are plump and full of meat. Dungeness crab is sold several ways. We have found that buying live crabs will guarantee freshness and sweetness. It only takes ten minutes in a hot tub of salted water to bloom the deliciousness. (Cookiecrumb?). Today we are going to try a different way by grilling these bottom feeders of the bay. Mesquite charcoal lit and burning at a high heat is what the Weber vessel will need to turn these Crazy Crabs into edible delights. Five minutes covered on each side and then plunged into icy water will do the trick. Pluck the shells and reserve the meat. 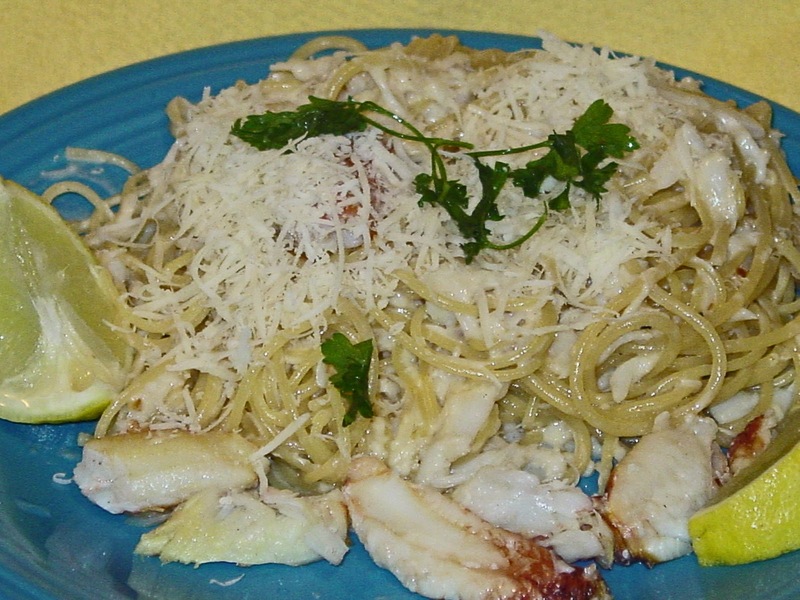 Cooked pasta, cream, various cheeses, heat and add crab meat and you will make one special dish. Zia our good friend over at Zia in the Kitchen made an apple pie the other day. She wanted to use an apple called ‘Arkansas Black’. This variety of apples lineage goes way back to the 1840’s located in Arkansas and later Missouri. 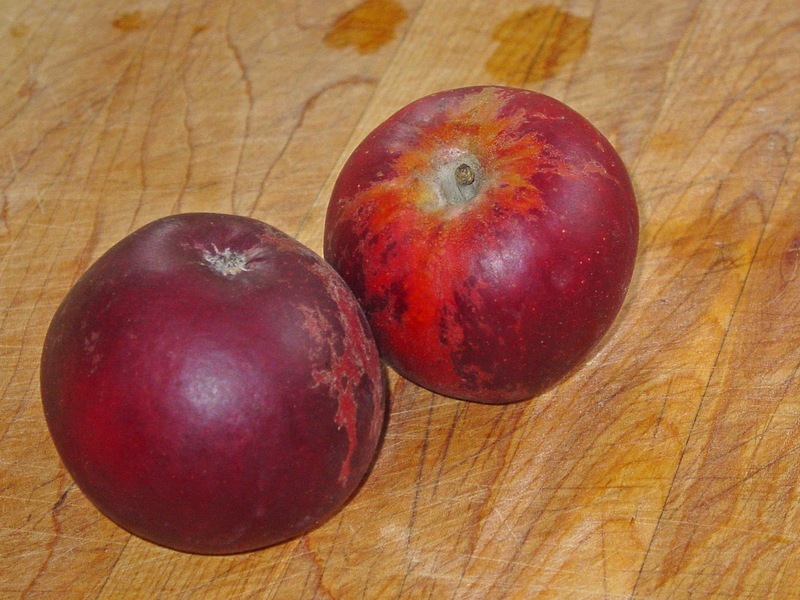 For some reason this apple is not well known in California. I have never seen it in our local markets till now. Some Arkansas Black apples were found at the Santa Rosa farmers market. The vendor would not offer a taste of this apple. That made it even more mysterious. She did volunteer the information that this apple was not good for baking and had a very unique taste. It is funny that all the ‘World Wide Web” information on this apple says it is great for baking. Living true to its name it is colored a reddish black. Crisp, juicy and sweet was my first bite. I had flavor thoughts of chardonnay, honey and a hint of vanilla. This apple has so much more flavor than a supper market ‘Red Delicious’. I thought this was a great apple for snacking. I will have to pick up some more to see if they are good bakers. According to the ‘WWW’ depending where they were grown and how long they have been in storage will determine if they are suitable for baking. 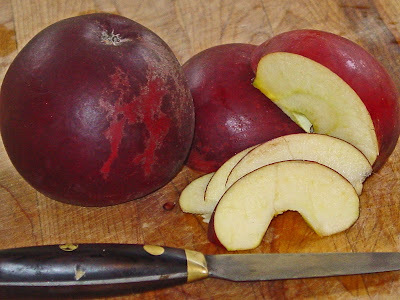 If you have an opportunity, pick up some ‘Arkansas Black’ apples and give them a try. Thanks Zia! Life sometimes can be cruel and unfair. With a heavy heart and tears in my eyes I will inform you that my nephew Jeremy has died of cancer. He was 38 years young with a wife and two young daughters. Needless to say we are very sad. 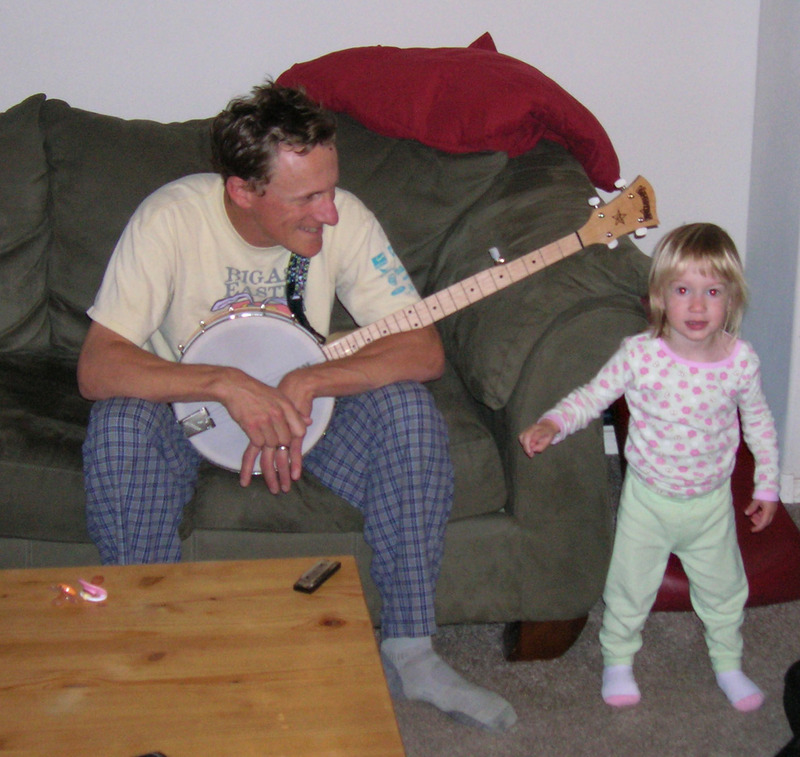 We are going to get together with the family this weekend. We are going to mourn Jeremy’s death. We are going to huddle and try to make sense of this tragedy. Hopefully our tears will turn to smiles as we share our encounters and stories about Jeremy. We will celebrate his life and the many accomplishments Jeremy achieved. I can guarantee food will play a minor part in this healing process. Lastly, I would like you to turn to your family and loved ones, give them a hug, and tell them that you love them. Jeremy would like this. We are concluding our bacon excursion. We are leaving with the inspiration that started this long strange trip of bacon enlightenment. 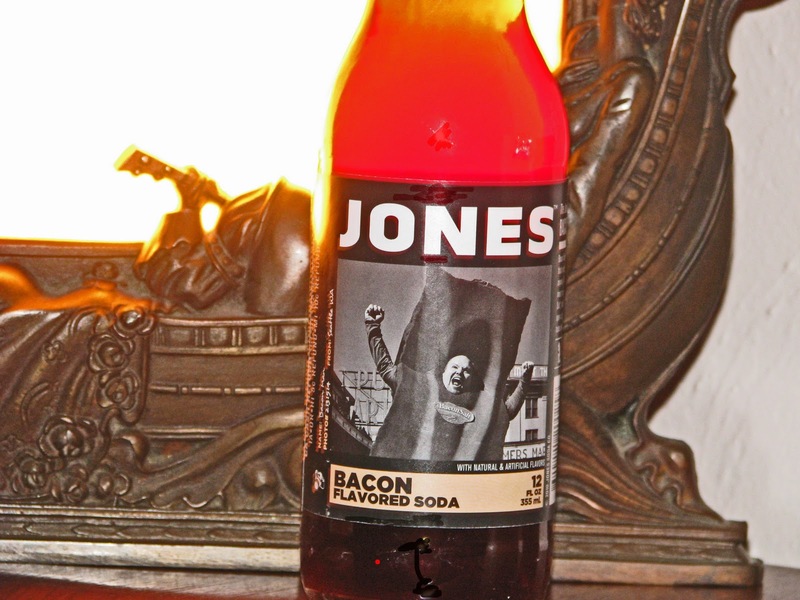 Bacon Soda will be the pop in our glass today. 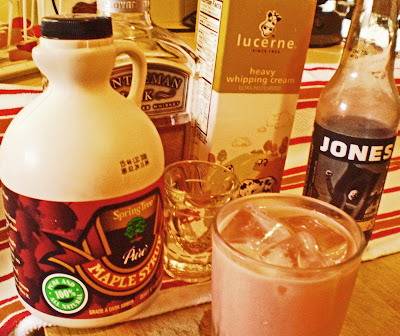 Bacon Soda caught my eye and in the name of research it had to be explored. The only way to experience this porcine beverage was to order the whole kit and caboodle of bacon products. This will explain the reason for bacon lip balm, gravy, and popcorn reviews. We will now pop the top and experience Bacon Soda. The top was popped and surprise, surprise it smelled like bacon. The soda was poured into a glass full of ice. The color was possibly a bacon shade of pinkish red. It looked a little scary to me. There was a lot of fizzing action. This brew had plenty of carbonation. I positioned my schnozzola over the glass and received a bacon spritzer of aroma. The first sip actually tasted like supper sweet bacon. A second sip was taken. A few seconds elapsed and then it hit me. Sugar, Oh man was it sweet. Then the afterburner kicked in and I tasted an aftertaste that I would not wish on anybody not even the “Spare the Air” board. Oh my, was it awful. I poured the rest down into the sink. The liquid drained away and left a reddish pink residue in the sink. Sugar?, Chemicals?, and nasty funk, what was it? The taste left in my mouth was horrendous. Believe it or not, I gave this soda a second chance. The distributors suggested using this bacon soda in a cocktail. Here is the recipe. Combine all ingredients except cream and soda into shaker filled with large ice cubes. Shake hard to emulsify egg white. 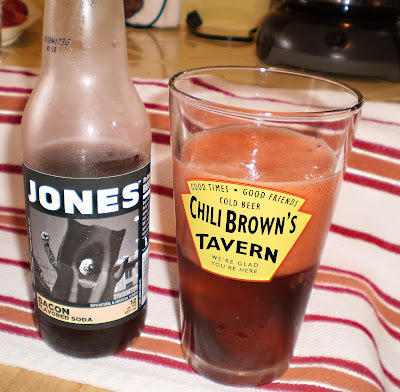 Strain into chilled 12 oz. glass. 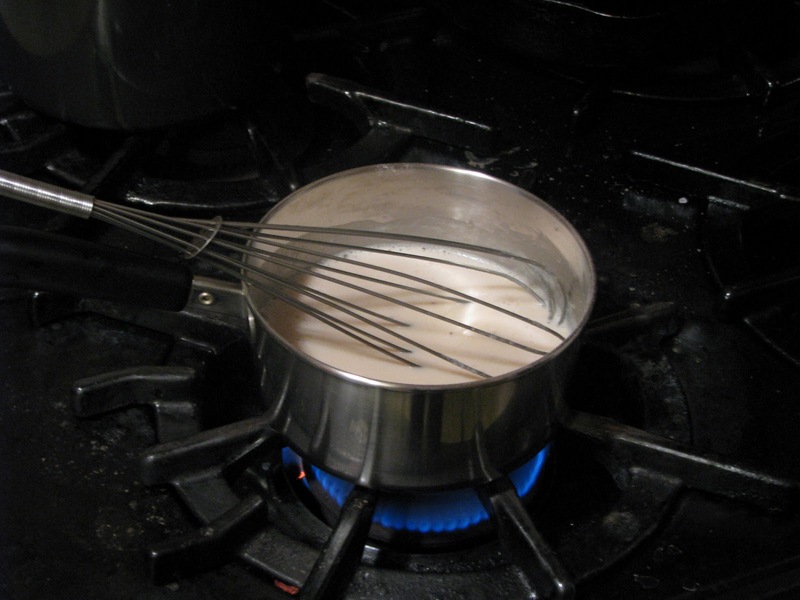 Add heavy cream, and stir. Top with soda water. I could not even take a small sip of this drink because, the bacon smell reminded me of the last swig that was experienced. I was disappointed that I wasted good bourbon on this recipe. A consolation swig of bourbon was taken and our bacon experience was pondered. 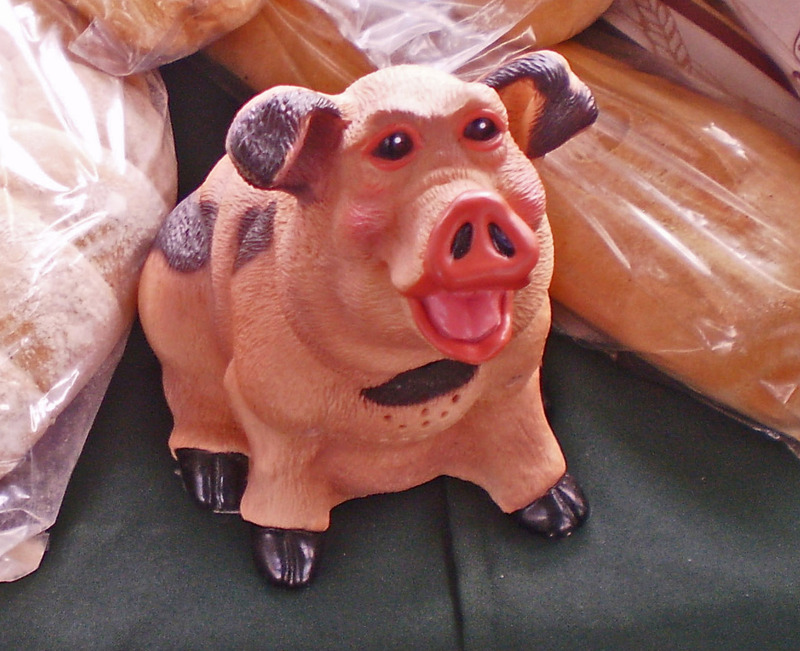 The Mad Meat Genius consensus is, leave the bacon novelty products for gag gifts. 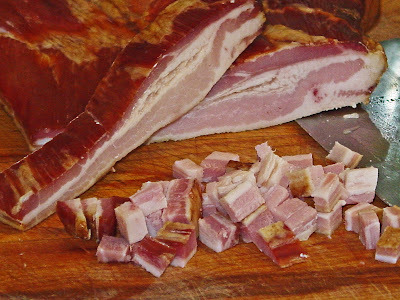 Stick to real bacon and create your own bacon flavored delights. The End, my friends. ‘It’s all about the gravy man!’ This is a philosophy that my mentor Dr. Biggles has preached and we have embraced throughout our journeys and ‘Meat Adventures’. 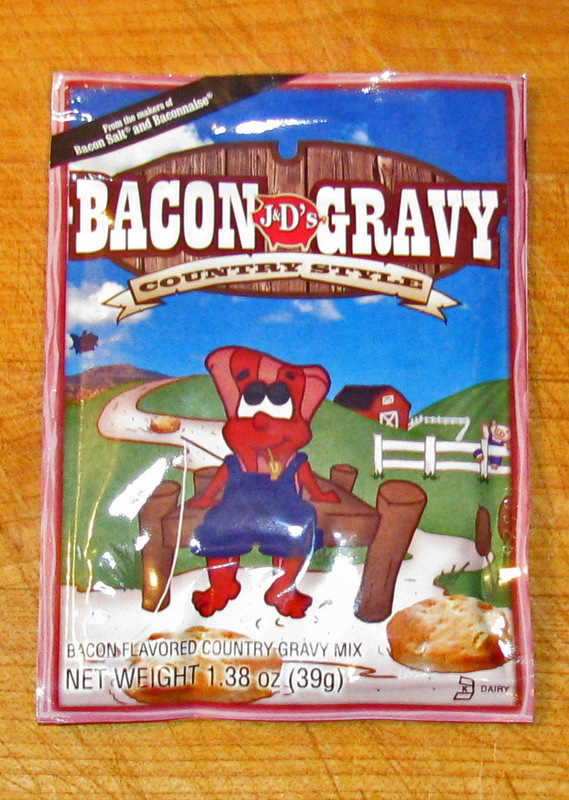 Packaged bacon gravy mix is on the table today. We will be tough but fair in our evaluation of this instant nectar to enhance our meat platters. Will this be another attempt to cash in on the new ‘Black’? Will it deliver to our plates of meat? Pull up a gravy boat and drift into the Madness! Creamy with bacony flavor was the verdict. This product will receive ‘Four Paws’ up rating from Ms. Goofy. She enjoyed it immensely. 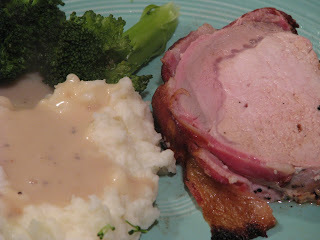 This thick and wonderful sauce lubricated and enhanced our bacon wrapped pork loin. I enjoyed it and think it is a great convenience product. You could bring it camping or to your office cubicle if it is equipped with a stove. No fuss, no muss, is this bacon convenience product. It is a great substitute if you do not have the time or bacon to make your own gravy. “It’s all about the gravy man”. 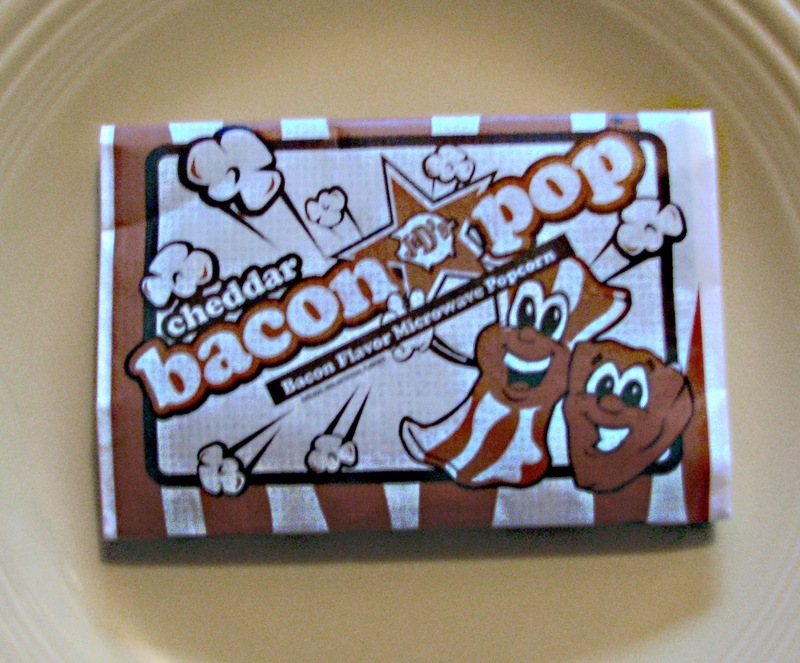 We are digging into Santa’s bag of bacon goodies today A bag of bacon flavored popcorn appeared, longing to journey and travel through the taste buds of our imagination. 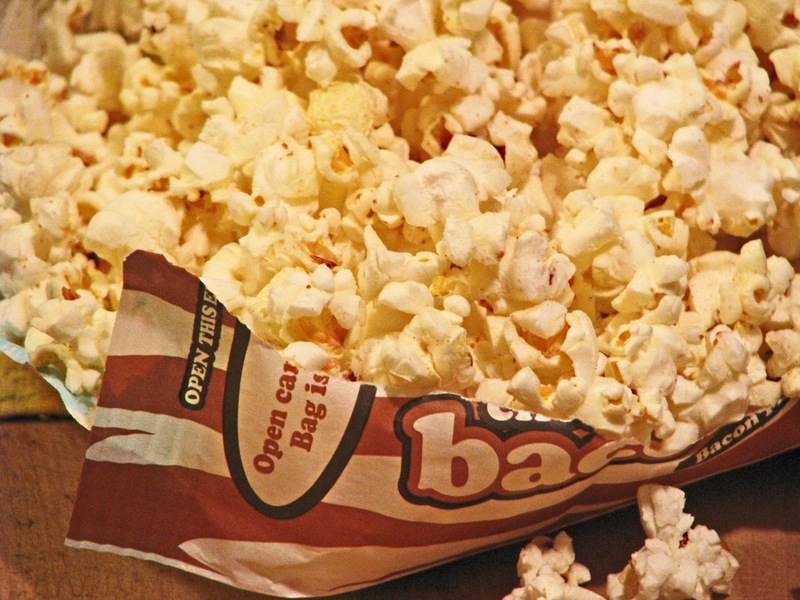 “Bacon popcorn?” is that so far fetched? Corn kernels swimming in bacon fat waiting for the microwave to release its porky goodness? Step over to the machine and let’s pop some corn. The instructions are simple; (Instruction side up, Microwave on high for 1-4 minutes until popping stops). 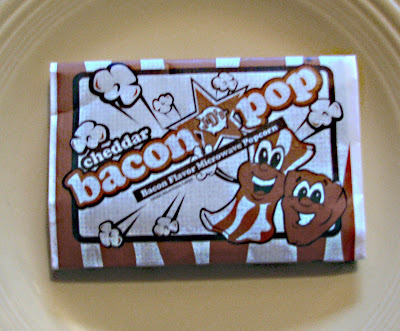 Two minutes into the popping phase, bacon aroma will escape and assault your senses. Who is frying that bacon? The fresh hot popcorn is a salty and buttery tasting treat. Where’s the bacon? I just noticed this is supposed to be cheddar flavored. Am I missing something? The popcorn is delicious as microwave popcorn can ever be. The aroma from the microwave teased and promised bacon flavor. It did not deliver in bacon or cheddar flavor. 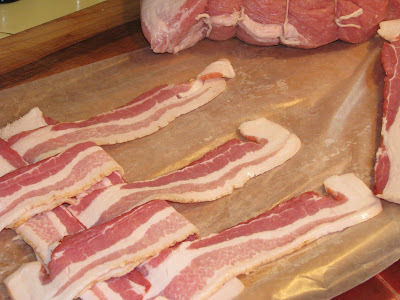 Next up could be maybe one of the best bacon products ever. The UPS man has officially kicked off the Christmas season by delivering a box of bacon products to our front porch. The anticipation of this delivery could be compared to a child, a Mad Meat Genius child, on Christmas Eve waiting for the arrival of Santa. 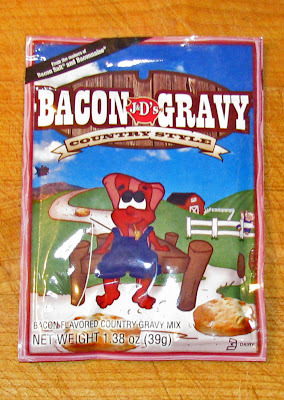 I could not wait till Christmas to open this package of bacon flavored merchandise. Over the next several days I would like to share the bounty of this package. 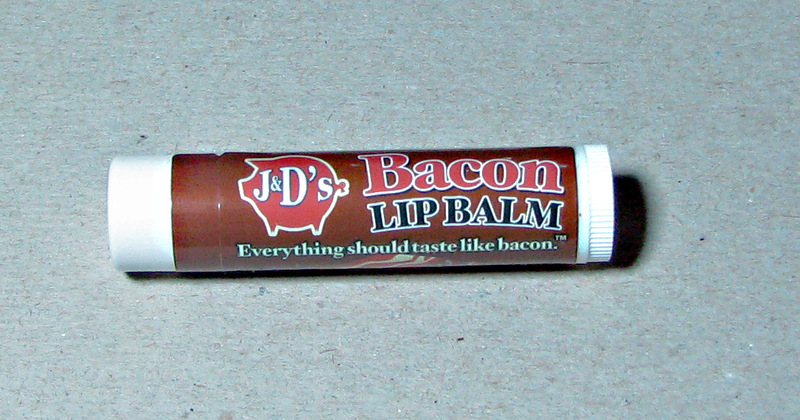 Today we will look and taste some bacon flavored lip balm. Let's whet our whistle. 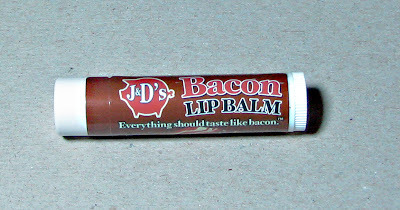 "Everything should taste like bacon" is proclaimed on this tube of porky flavored balm. The ingredient list was checked and no actual bacon was (harmed) found. There were a lot of scary sounding ingredients that I hope tastes like bacon. The color of the balm is a shade of light bacon brown. A bacon aroma emits from the tube. 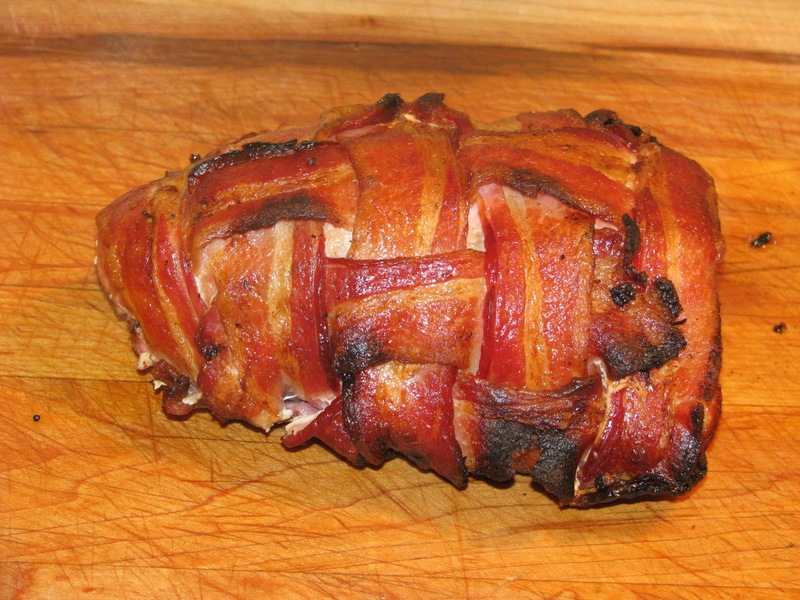 The initial application did have a pleasant bacon type of flavor. This product is pure genius. Whenever I need a little bacon lift, a quick swipe to the lips will temporarily satisfy my bacon wants and keep my lips from chapping. Stay tuned for more bacon. The Thanksgiving holiday was delicious. It is back to the salt mine. This tune is dancing through my thoughts in anticipation of my bacon package. We have ordered some bacon flavored soda and other bacon flavored products. The UPS tracking label promises a delivery today. It may be Christmas a little early when I get home. I don't know how I can ever wait to thee. It is almost done. 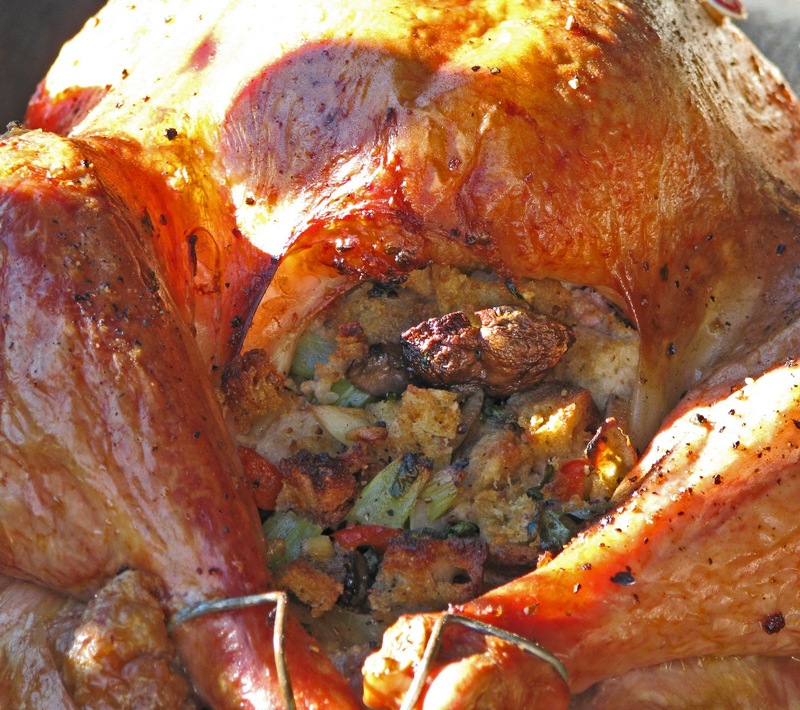 The stuffing was made with home made bread. 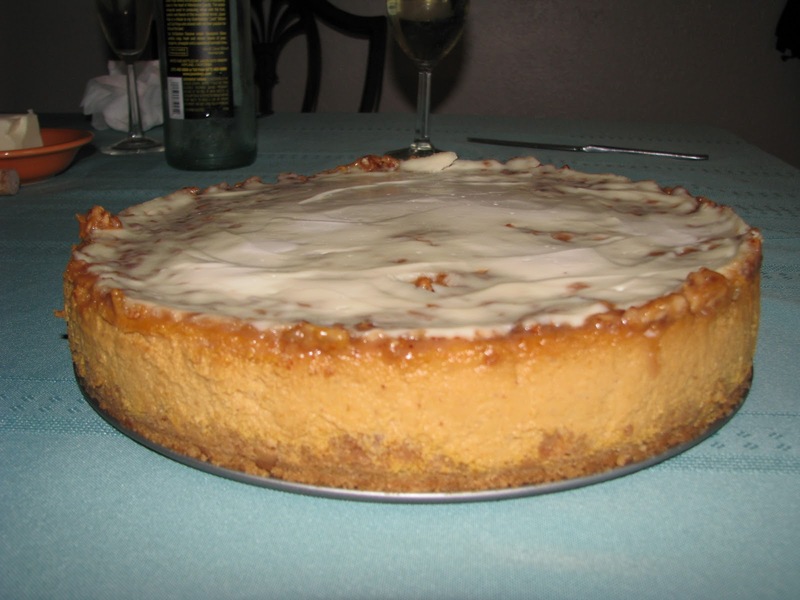 Ms. Goofy has a pumpkin toffee cheesecake that will be topped with caramel sauce. She has it hidden in our ice cave and I have been told hands off until dessert. Hope you are having a wonderful Thanksgiving! 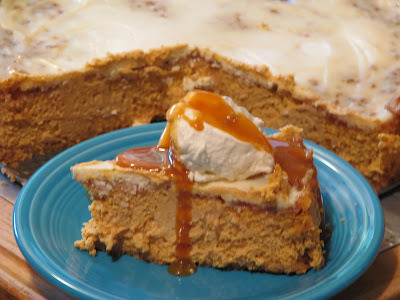 Ms, Goofy went to the ice cave and removed this cheesecake of pumpkin and caramel toffee delight. It was sliced and covered with caramel sauce, Oh my! Our adventure to Greenleaf BBQ resulted in a purchase of a bag of oak wine barrel smoking wood. This is Greenleaf’s signature smoking wood. It is recycled wine barrels that have been cut up into small chunks for bbq smoking use. Purple wine residue is present on these vinegar and wine smelling wood chunks. 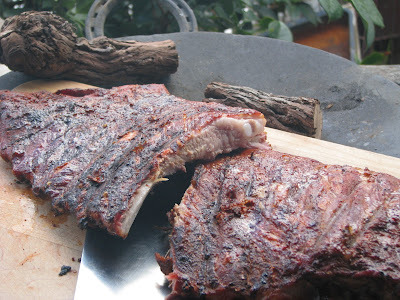 Hard woods like oak are ideal for use in the barbeque. 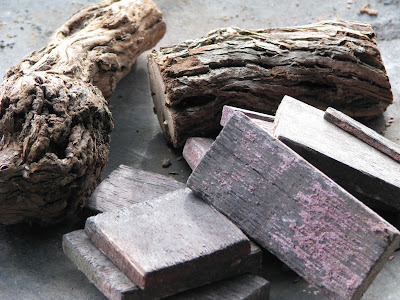 Different varieties of wood will impart unique and subtle flavor profiles when used for smoking. The question is; what flavor will the Oak wine barrel wood create? Let’s start a fire. 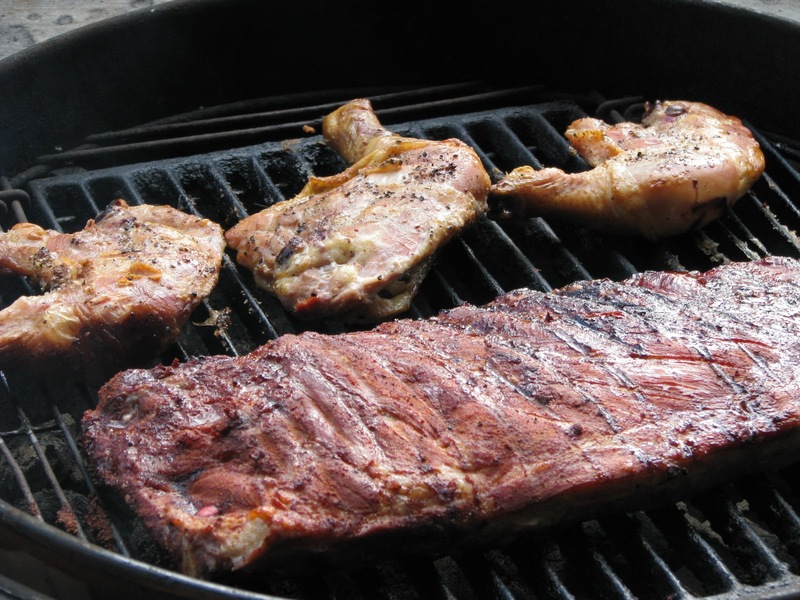 Ribs and chicken will be cooked on a Weber kettle to sample this product. The chicken will only be seasoned with salt and pepper. I did not want to use a rub that might mask the flavor of the smoking wood. The ribs were rubbed with my favorite rub. A chimney full of charcoal briquets was put to the fire. The vents of the kettle were open half way. The fire was spread evenly over the floor of the kettle. Four pieces of the wood were spread evenly over the coals. The meat was put on the grill and the lid was locked in place. The chicken was turned several times for 45 minutes and 70 minutes for the ribs to create cooking perfection. The chicken was a gorgeous golden brown. The ribs were falling off the bone. You could smell smoke but it was not overpowering. The chicken absorbed the most smoke. We did taste a sweet smoke flavor. I am not sure if wine could be identified. The ribs had a smoke flavor but the rub taste was more prevalent. 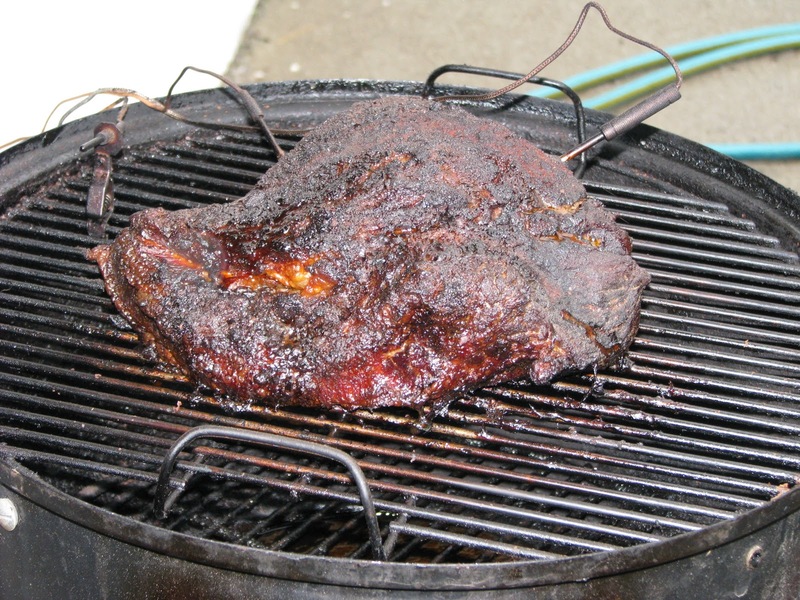 The Weber kettle, with a small direct heat, may not have not brought out the full flavor of this smoking wood. We were very pleased with our meal. It was finger lickin fantabulous. Next time we will use a designated smoker to impart more of the wood flavor. We will put our conclusion on hold until the next barbeque. Can one have too many tools/gadgets? I do not think so. Here is my latest must have barbeque tool. 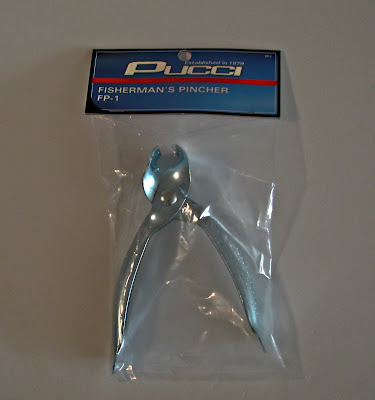 It is a simple catfish skinner. 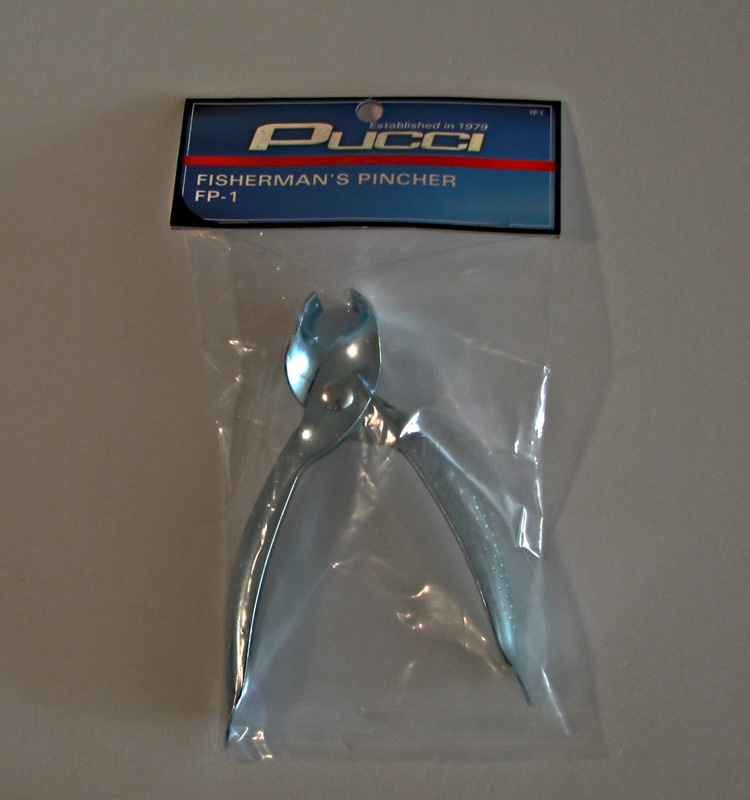 These plain ordinary pliers will make the chore of removing the membrane from ribs a simple task. Where have you been all these years? 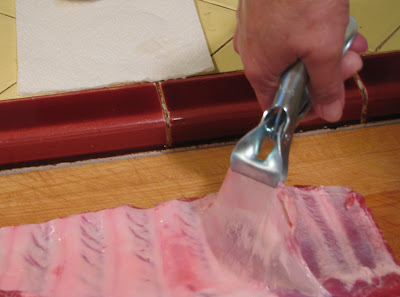 The rib membrane can sometimes be slippery and stubborn to remove. In the past I have used a knife and towel and now realize how Neanderthal this method was. The test was on some pork ribs. Easy as pie was the result of this wonderful contraption. Now I can rest easy knowing that removing the membrane will no longer be such a drama. 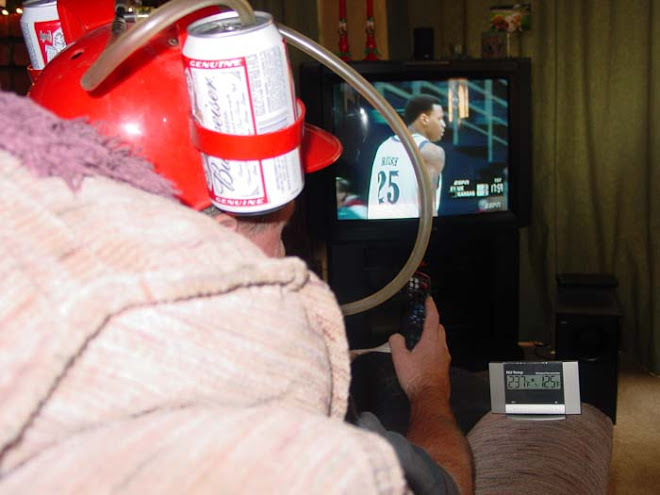 Best invention since sliced bread. This will make a great stocking stuffer for your barbeque sweetie this Christmas. First crab of the season. Two and one quarter pounds a piece and as sweet as can be.. Two dollars and ninety nine cents a pound for live, crabby, crazy and oh so delicious crustacean.. Oh my! Crab cakes tonight.